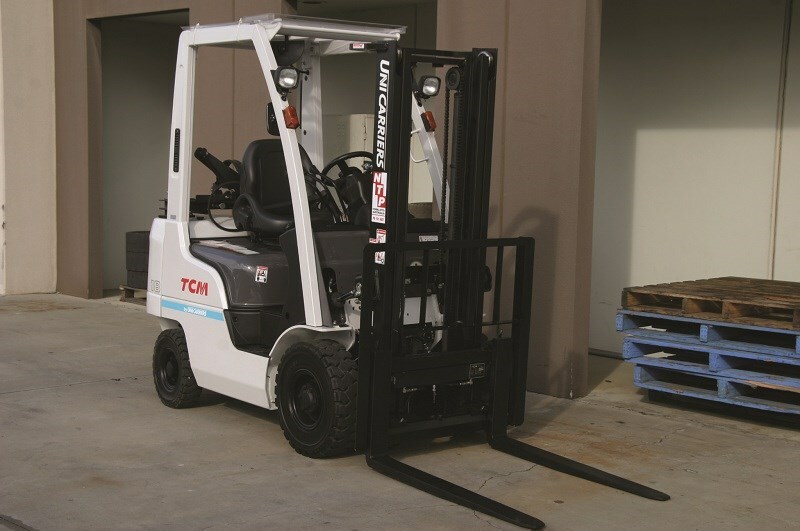 TCM’s newest, cleanest, greenest range of forklifts bring an impressive range of safety features to the factory floor. If you have a feeling of déjà vu about TCM’s new F1 series forklift don’t be alarmed. While there’s a lot that is genuinely new, there’s a good deal that’s been seen before. Think of the new model as an evolution of an existing, successful range but now fitted with some modern technology to cut costs, emissions, fuel-burn and fatigue. What’s not to like about that? What is now known as TCM was founded as Japan hauled itself out of the second World War, building the first Japanese forklift in 1949. In the decade following, it signed a deal with Clark, built a 10-tonne forklift and started exporting, coming to Australia in 1963. More recently, and ignoring the global financial crisis hangover, Hitachi became the sole shareholder in 2009; from 2011 agreements with Nissan saw the creation of global manufacturer UniCarriers, which builds TCM-branded machines that share technology with the former Nissan-branded forklifts. 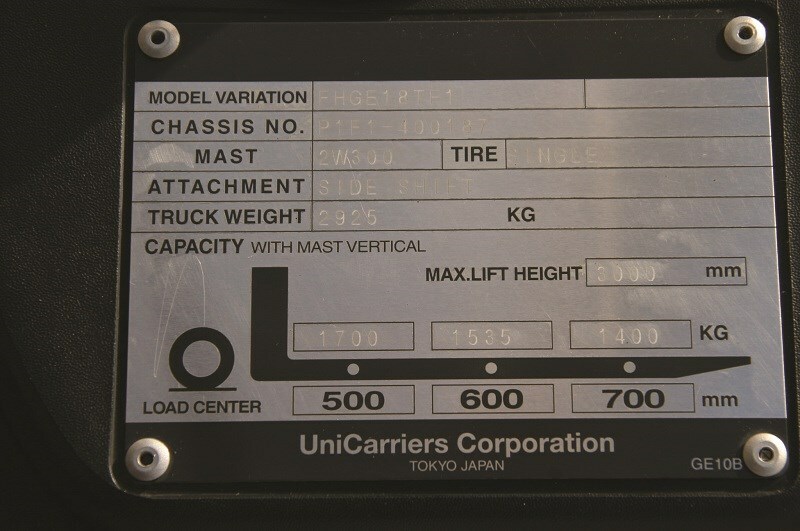 Nissan built forklifts from 1957 and became UniCarriers in North America in 1993. 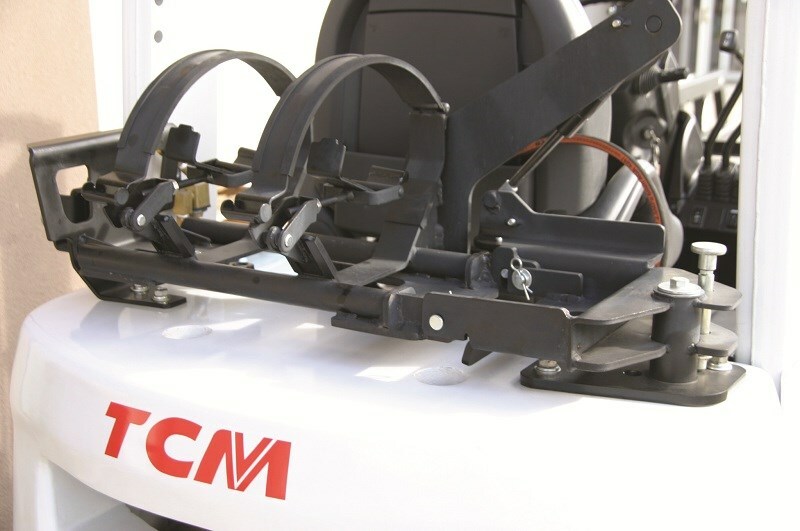 TCM units are handled in Australia by market leader NTP, along with a wide array of other materials handling products and brands such as Jungheinrich and Manitoba, to name but two. Far from being merely a boardroom reshuffle, the newly-consolidated UniCarriers has an eye on environmental concerns. 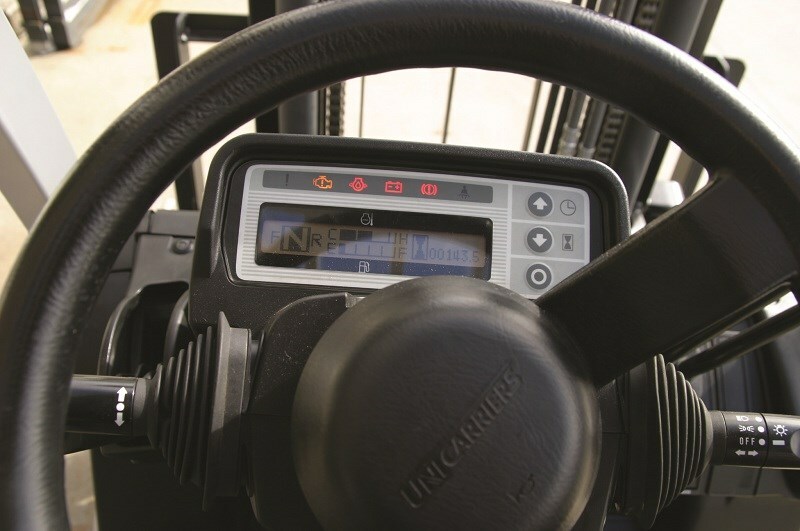 For example, the new FGE25TF1 model offers an environmentally friendly electronic fuel injection (EFI) engine and various security and safety initiatives that will have operators of older forklifts talking to their accountants. The ‘25’ part signifies it’s a 2.5-tonne lifter, part of the F1 series, which is available in 1.8-, 2.5- and 3-tonne configurations. In fuel-injected guise, the 2.5 tonner is about 20 per cent more fuel efficient than its older carburetted forebear. The safety features make the Aussie-sold models among the highest-specced standard machines in the world. For a start, without a correct PIN, the TCM won’t — start, that is. Up to five different PINs for different operators can be programmed — and data-logging will unmask the night shift hoon or King Bludger. Then there’s the seat belt interlock — without the belt being used, the forklift’s hydraulic functions are disabled — so a carelessly parked machine can be quickly shifted out the way, but to do any actual lifting, the operator needs to be fair dinkum about the task at hand. Maximum speeds can be set too — either a blanket maximum, or different top-ends for internal and external movements. A static stability system is impervious to environmental conditions and is unaffected by dust, heat or water and helps reduce the risk of tip-over incidents. A standard feature is a programmable idle-time, which shuts the machine down if it’s left idling too long. 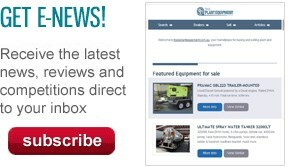 This cuts the opportunity for unauthorised use and reduces fuel use and emissions levels too — a good thing if the machine’s being used in confined spaces such as stuffing or unstuffing containers. This also means that only on-the-job working time is recorded on the meter: hours where the machine was idling but not actually working aren’t logged. Why should you care? Because scheduled maintenance periods off-line will be stretched apart: servicing is only needed when the fork’s reached its actual hours-worked target, not total run-time. Plus, this means that when time comes to trade up to a newer model, the hours will be lower: some maintenance charge-hands are shocked it’s shown just how much time their machines are doing nothing. The bean counters will love this feature, especially those at hire companies. The forklift will also self-analyse. If it’s getting too hot, the electronics go into a reduced-power, limp-home mode until it’s had time to cool down and regain its composure. Using either petrol or liquefied petroleum gas (LPG), the injected engine has a three-way catalytic converter and is both frugal and powerful — plus, it can be operated in Eco-mode, which cuts peak power in exchange for improved range. In fact, the truck can be locked into Eco-mode permanently — and because the EFI engine makes so much more power than its predecessors, even experienced operators might never know they’ve been locked out of the upper extremes of available power and performance. Burning LPG from a rechargeable bottle that fits in a back-saving swing-down bracket in the usual place above the counterweight, the EFI alone results in a fuel burn around 20 per cent more efficient than previous, comparable carburetted models. 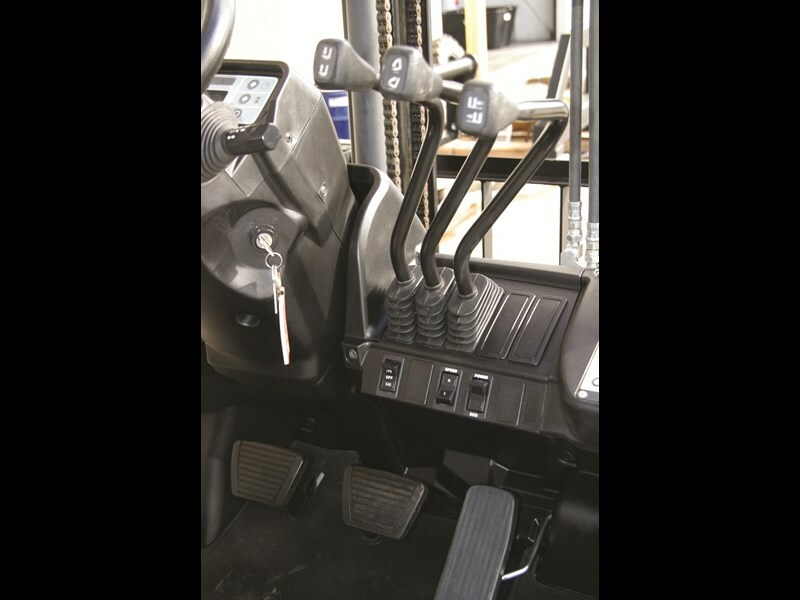 Other nice-to-have features include better sound deadening material inside the engine cover, a belly plate to protect the underside of the truck from snag hazards and a digital weight gauge, so the driver can see if he’s getting near the edge of the machine’s lifting and loading capacity. It’s not a mission critical, super accurate measure, but it gives a good indication of what’s possible and what’s not. What isn’t quiet is the reversing alarm — in a noisy commercial environment where sound sources are many and varied, and ear defenders may be mandatory, a penetrating reversing alarm is a very real potential life saver and the TCM manages to be penetrating — even for us older, half deaf guys — without also being painful or intrusive for other workers who may be focussed on unrelated tasks nearby. Besides being seen (and heard), seeing is obviously critical to safe forking and the driver’s field of vision is pretty good: the mast is as clear of obstructions as seems possible; the driver’s seat is high and the bolt-on replaceable rollover protection structures supporting A- and B-pillars are stout but not huge. Well placed curved mirrors give a good idea of what’s happening behind and around the truck. Access is as easy as you could hope for this type of machine, which is to say, you won’t find any parked in a handicapped bay, but ... ahem... ‘stouter’ operators will find little reason to gasp and wheeze while clambering aboard, thanks in no small part to the generous and low step. The controls are light and responsive, well weighted, predictable and linear. The forks will sprint up and down the mast if asked, but finer, millimetre-perfect control anywhere up the tack is also possible, thanks to the tactile, sensitive and smooth-working hydraulic controls. You know how an experienced forkie can jump onto a truck and pretty-well immediately take control and use it to the full? This truck makes even a rank novice look like an expert because the ergos work well — logical, uncomplicated, clearly labelled and the machine seemingly does everything except think for you. Find TCM forklifts for sale. Look up TCM forklift specifications. UniCarriers has a venerable history. The swing-down bottle bracket is well regarded. 10 Controls are light and responsive. 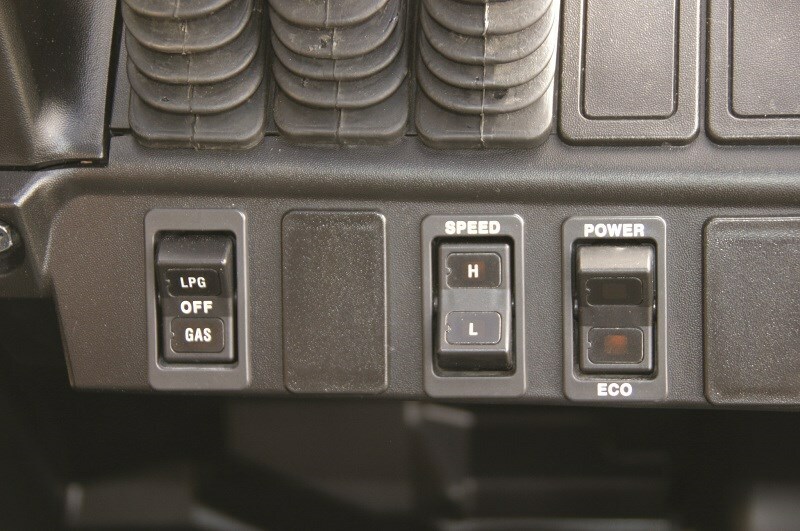 Eco-mode, which cuts peak power in exchange for improved range . What the tines will take where.